GROUND INSTRUCTION in map reading. The instructor, seated in the machine, is explaining to his pupils how to fold a map for reading in the air, and the importance of orientating the map so that the route to be followed lies in the same direction as that in which the machine is flying. Such ground instruction is as important as the lessons in the air. FLYING tuition is today highly developed, and modern methods make it safe. Pioneers had to teach themselves to fly. 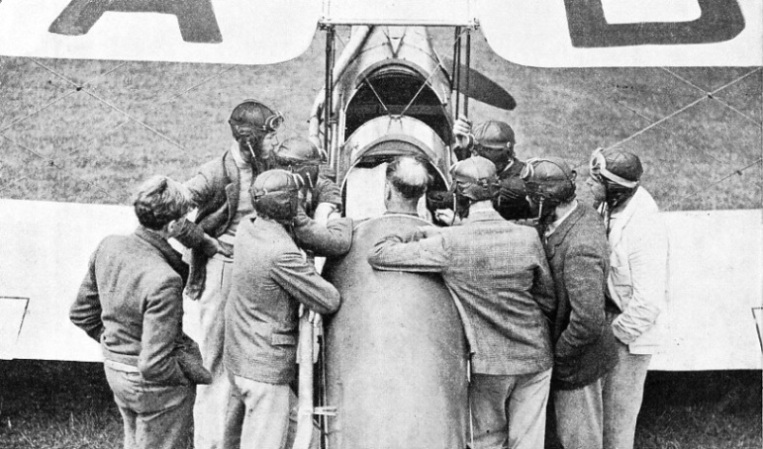 At a later stage the pilot learnt with the aid of an instructor leaning over his shoulder from another cockpit. Nowadays there are duplicate, interconnected controls, one set for the instructor and the other set for his pupil. The civilian pupil is taught at a flying school or club. There is little difference between the two, but the clubs are generally subsidized by the Air Ministry and are, therefore, able to offer lower rates. 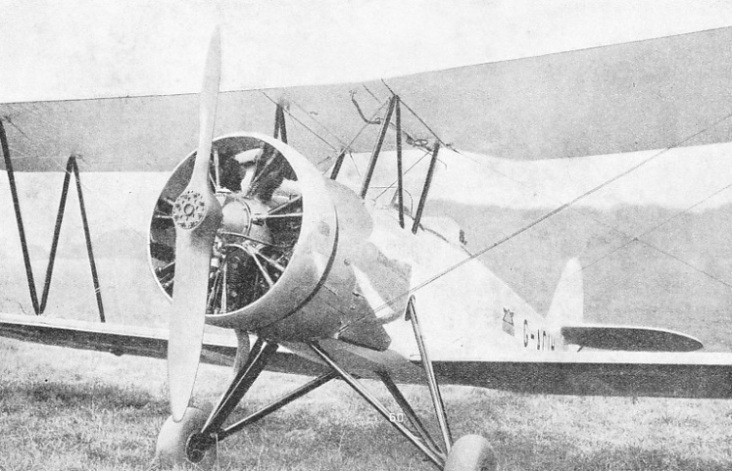 The most common form of training machine is a two-seater biplane with the cockpits in tandem. The pilot’s cockpit is the rear one and the pupil always sits here. 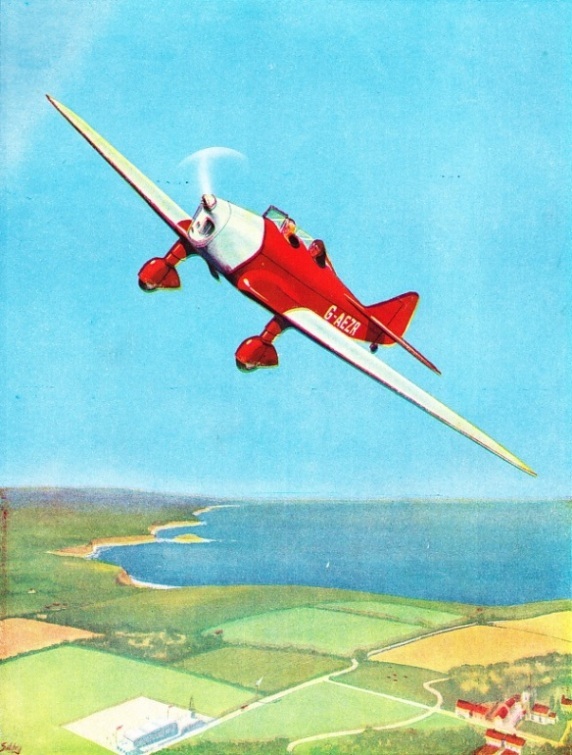 Two-seater, low-wing monoplanes also are widely used for training purposes. 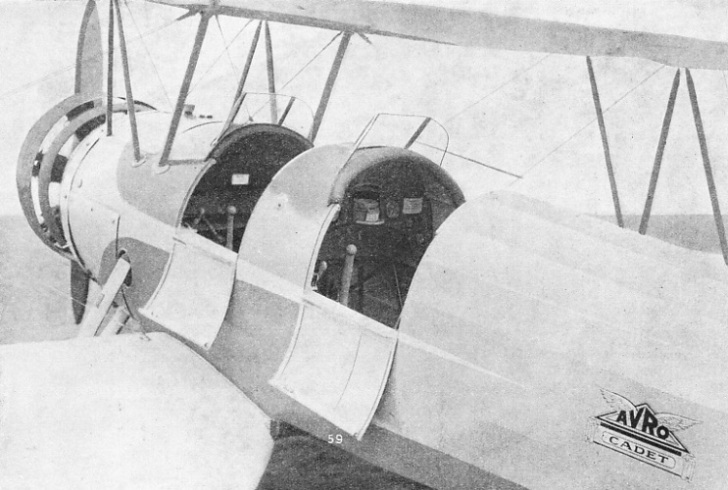 Sometimes light, two-seater, high-wing cabin monoplanes are also used, in which the seats are side by side. Ordinary flying does not call for any special knowledge or talent and few of those who wish to learn find themselves unsuitable. Neither is great courage required. On the contrary, people who are inclined to be nervous often make excellent pilots. Quick reaction between mind and muscle is the most important attribute in a pupil. An even temperament is helpful, for a tendency to panic easily is obviously undesirable. The chief requirement for eyesight is a normal degree of rapid focusing and adjustment. The nearest parallel possible to the experience of piloting an aeroplane is a combination of horsemanship and sailing. A knowledge of sailing, as it creates a respect for wind direction, is useful; and a good horseman has firm but sensitive hands which will help him to obtain quickly the “feel” of an aeroplane’s controls. Contrary to a popular belief, long experience of motoring is helpful only so far as it develops quick muscular reaction and some knowledge of internal combustion engines. For a pilot’s “A” licence (for private flying) and for a pilot’s “B” licence (for commercial flying), a certain standard of physical fitness is required. The medical test for the “B” licence is much more severe than that for the “A” and does not permit the wearing of spectacles. The examination for the “A” licence may be conducted by the applicant’s own doctor; the standard for a pass is approximately equivalent to that for a first-class life assurance policy. Faulty eyesight is not a disqualification if it can be sufficiently corrected with the aid of glasses. Little special clothing is needed for flying training. Long periods are not spent in the air, so that slightly more covering will suffice than the average summer or winter clothing provides. THE EFFECTS OF THE CONTROLS on the attitude of a machine are to raise or lower its nose, to produce bank to left or right and to turn the nose of the machine to left or right in relation to the horizon. For open-machine training a flying helmet is required, fitted with telephones which work on the speaking-tube principle. It is important that the helmet should fit snugly, as otherwise the efficiency of the telephones would probably be seriously impaired. Goggles are advisable, although the cockpit of the modern machine is reasonably free from draughts. Certain manoeuvres such as sideslipping cause considerable side wind, and it may be necessary for the head to project out into the propeller’s slipstream when the machine is taxying. If spectacles are worn the need for goggles is not so great. It is possible to buy goggles with special lenses and thus obviate the discomfort of wearing glasses and goggles together. Good goggles which will not get misty should be chosen. If gloves are worn they should be thin and pliable. If they are fur-backed they will be found quite warm and will allow a good “feel” of the controls. Similarly, clumsy boots with thick soles are to be avoided. The number of hours of instruction required before a pupil is able to take an aeroplane up by himself varies with the individual. Eight to ten hours is about the average number. Quickness in learning, however, is by no means the criterion of a good pilot. Some of the best pilots learn slowly. The first thing for a prospective flying pupil to do is to have a passenger flight if he has never before flown in an aeroplane. There will be no attempt to teach the pupil anything about the controls on this first flight. Its object is merely to accustom him to being in the air. He is left free to take in experiences which are entirely new to him. Many people who have never flown express a dislike of flying because they find the motion of a passenger-lift disturbing, and anticipate a similar sensation in an ascending or descending aeroplane. In normal flight the take-off can be so gentle that the passenger does not realize when the wheels have left the ground, and probably he notices that the aeroplane is rising only when he sees trees and houses fast receding. Similarly, when coming down to a normal landing there is no resemblance to a lift-descent. Another experience, probably unexpected, is that there is no sense of height, and therefore no giddiness. Unlike high buildings and cliffs, an aeroplane has nothing connecting it to the ground, and it is this connexion which produces the feeling of giddiness on high buildings and cliffs. There is also little impression of speed, because height makes the aeroplane’s passage over the country seem quite slow. Only when the aircraft is flying low for take-off or landing is any impression of high speed obtained. instructor have sets of controls so that either may fly the machine at will. As soon as the passenger is sufficiently accustomed to his new experience, he is able to look round. He will notice two things - the surprising amount of colour on the ground and the apparent flatness of everything. This flatness makes familiar objects rather difficult to recognize at first. Probably the outstanding impression of a pupil’s first flight as passenger will be that of a mental thrill, rather than a physical one. The sequence of the details of instruction varies slightly between one school and another and between one instructor and another. So far, however, as the order of the main items is concerned, no instructor departs from what is the logical arrangement. Before a pupil has his first lesson, he must, of course, know something about the controls and the instruments of the machine he is going to fly. For this purpose he is taken to a machine and seated in the pilot’s cockpit, while the instructor standing outside describes the controls, the instruments and their purposes. Coming up from the floor, and in the centre of the cockpit, is the control column or “joystick”. This may be moved backwards and forwards; it may also be moved sideways irrespective of its fore-and-aft position. When it is pushed forward it turns down the elevators at the tail of the machine, causing the tail to rise and the nose of the machine to drop. When the joystick is pulled backwards, the opposite effect takes place and the nose rises. By moving the stick over to the left, the aileron on the right wing is lowered and that on the left wing raised. The right wing is thus lifted while the left is depressed, causing the aeroplane to bank to the left. 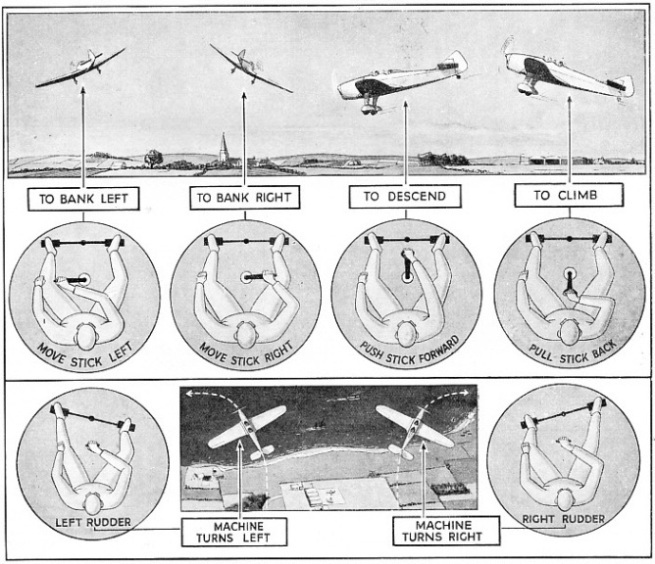 Similarly, by moving the stick over to the right the aeroplane is made to bank in that direction. Down by the feet is the rudder control, in the form of a bar swivelling at its centre. When the left foot is pushed forward the rudder at the tail of the machine is moved on its hinges over to the left and the machine will turn to the left. By pushing with the right foot the machine can be made to turn to the right. The action of the rudder control is similar in its effect on direction to that of the rudder cords of a rowing boat, and is opposite to the way in which the handlebars of a bicycle are moved when making a turn. Complete control of the machine’s attitude in the air is achieved by means of the joystick and the rudder, because they enable its direction to be controlled in any one of three different planes. At his present stage the pupil is concerned only with the use of the controls separately, but later he will have to learn how to combine the various effects which they produce. The joystick should be held firmly between the fingers and thumb of the right hand, but not gripped tightly, the left hand being left free for the engine throttle control, which is to the left of the pilot. It is advisable in all early flying, and always when landing and taking off, to keep the hand on the throttle - ready for an emergency. The engine is speeded up by pushing the throttle forward, and this and all other movements of the throttle should be made progressively. On some machines there will be a second, small lever adjacent to the throttle lever. This is for altering the petrol mixture when flying high, and will not concern the pupil at an early stage. THE MILES MAGISTER is a low-wing cantilever monoplane often used for instructional purposes. The pupil who is learning to fly sits in the back cockpit, his instructor in the front. There are dual controls and complete sets of standard instruments in both cockpits, with a special hood so that instruction in blind flying can be given. The Magister has a maximum speed of 145 miles an hour at 1,000 feet and a stalling speed of 45 miles an hour. The service ceiling is 18,000 feet. The engine is a De Havilland Gipsy Major of 130 horse-power. The final control which concerns the pupil is the tail-trimming device. This does not always function in the same way, but its effect is the same. When a machine is flying with a passenger there is more weight forward than there would be if no passenger were being carried, and without the tail-trimmer a slight continual back pressure on the joystick would be required to keep the machine level. The tail-trimming control provides a means of obtaining level flight without this pressure being applied to the joystick. In most training machines the tail-trimmer is put about two-thirds the way forward for a take-off and right-back for a landing. In front of the pupil is a number of instruments, but he does not need to pay much attention to them during his first lesson. After that, the sooner he becomes accustomed to keeping a watch on them, the better. Most important of all is the air speed indicator, generally abbreviated “A.S.I.” On this dial, which is calibrated in miles an hour, is a red mark at the slowest speed at which the machine can fly. Normally the speed must be kept ten to fifteen miles an hour above this. The altimeter indicates the height of the aeroplane, but must not be relied upon below about 200 feet. A device is provided for setting it to zero when on the ground, so that it will show the number of feet above an aerodrome irrespective of the height of that aerodrome above sea level. The remaining flying instrument that concerns the beginner is the “bubble”. This is a form of curved spirit level, and shows when the machine is flying level or turning with the correct degree of bank. Two engine instruments need consideration, the revolution counter and the oil pressure gauge. The correct number of cruising revolutions is printed near the revolution counter, and may be exceeded for a very short period only. The normal oil pressure is marked also; any considerable deviation from the normal reading indicates that trouble is developing in the engine. If the machine is fitted with a compass, or with blind flying instruments, the pupil is told to ignore these completely for the time being. But he must become used to the positions of the other instruments, so that a single quick glance will provide him with the information he requires. The engine switch may be on the instrument board, or on the outside of the fuselage. It has two knobs, close together, so that they may be operated simultaneously when desired. Each knob controls one of the two independent ignition systems of the aeroplane. The knobs are up when the engine is running; the act of pushing them down switches off the engine. Time will not permit the instructor to go into the whole theory of flight, but it is to the advantage of the pupil to understand something about it, and if he is wise he will have made a study of the subject before presenting himself for his first lesson. With the preliminary ground instruction completed, the pupil is ready for his first lesson; but there are one or two considerations to be dealt with before the instructor can take his place in the front cockpit and give the order to start the engine. THE SIDES OF THE TWO COCKPITS in this training machine are lowered so that both control sticks are visible. Most machines are normally flown from the back seat, and in some machines all the instruments are duplicated; in others only the more important instruments are to be found in the front cockpit. Unless the pupil has a wide range of view, he will not be able to obtain the greatest benefit from his lessons; therefore the number of cushions on his seat is adjusted that he may see comfortably out of the machine. If he has short legs, a cushion behind his back may also be necessary, to aid him to reach the rudder bar easily. Once he has found a comfortable position, the pupil should endeavour always to have the same number and arrangement of cushions, so that his view from the machine is always the same. The harness or belt has next to be adjusted. Harness comes over the shoulders and keeps the body in position better than a belt, but both are provided with a quick-release pin. The harness or belt should be comfortably tight and always used. Its chief purposes are to prevent the pilot or passenger from being thrown forward should a bad landing cause a “nose over”, and to enable the pilot to retain a steady pressure on the controls in “bumpy” weather. The pupil has next to join up his telephones by fitting their tube into the rubber connexion he will find in his cockpit. He will see also a rubber mouthpiece by means of which he can talk to his instructor. Should the pupil find difficulty in hearing when the engine is running, slight pressure applied to one of the earpieces beneath his helmet should overcome the trouble. Before starting up the engine, the instructor will ask his pupil to move the controls and note how easily they respond. In the air, they will not move nearly so freely, because of the wind pressure on the control surfaces at the tail of the machine and on the wings. The faster the aeroplane moves, the stronger will be the resistance of the controls. The instructor is now ready for the engine to be started, which will be done by an engineer swinging the propeller. The instructor then taxies out on to the aerodrome, ready to take off. The pupil will probably notice that visibility from his cockpit in a forward direction is not good; this is due to the tail-down position of the machine, and will improve when the machine is in flight. The instructor takes the machine off dead into wind. Having climbed up to 1,500 or 2,000 feet, the instructor puts the machine into level flight and points out to his pupil the position of the nose in relation to the horizon. This position has to be memorized, so that the machine may be put level whenever necessary. Next, while the instructor retains control of the rudder, the pupil takes control of the joystick and tries the effect of putting it forwards and then backwards. Large movements are not required to change the attitude of the machine considerably, and jerky movements must be avoided. Having tried the fore and aft control, the pupil may move the stick from left to right, to note how bank is obtained. The instructor will not allow bank to be held in either direction for long, otherwise the nose of the machine will begin to drop. This is due to what may be termed “the further effect of the controls”, and will be explained to the pupil in a later lesson. Finally, the rudder control is tried while the instructor holds the joystick. Here, again, if the control is kept over to one side long, the nose will begin to drop. Both controls are now tried together, and an attempt is made to fly the machine straight and level. At first some difficulty will be experienced, because the necessary control movements are overdone. The tendency when, for instance, the nose of the machine drops is for the joystick to be pulled too far back, and before this is noticed the nose of the machine has risen above the horizon. An inclination to a see-saw action is thus set up. With rudder, elevator and ailerons, it must be remembered that as soon as the necessary movement of the machine has occurred to bring it back to straight, level flight, the controls must be immediately centralized, or a movement in the opposite direction will take place. The wings can be kept level by watching them in relation to the horizon and keeping them parallel with it. For checking up on the use of the rudder, some point near the horizon, such as a large tree or prominent steeple, should be taken as a point of reference. STEADY IN BAD WEATHER the Avro Cadet is a popular training machine. 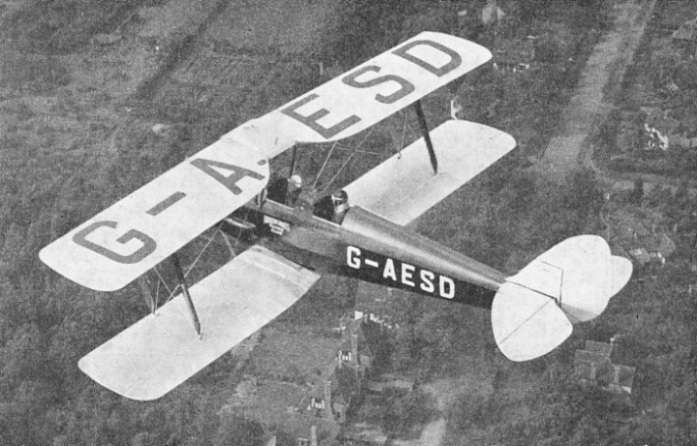 The Avro Tutor is a similar type of aeroplane and one of the few light training machines that have radial engines.